If you’re anywhere in the northern hemisphere in the US about now, then it’s not exactly what you would likely consider “landscaping time.” It’s not by any stretch of the imagination a time to be out planting or trimming. But what IS it time for? Hardscapes! The winter is a perfect time, at least in places without snow, to be pushing out new additions to your landscaping in the form of hardscapes. 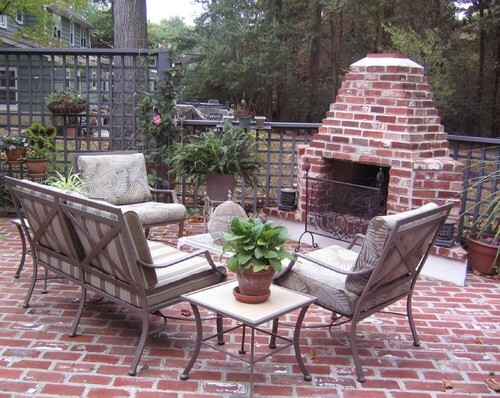 This can be things like patios, retaining walls, new outdoor fireplaces, fencing, and the like. Provided the ground is not frozen, it’s great to be doing this work when it’s cooler for several reasons. It’s not nearly as busy for your landscapers – they are usually more excited about doing these more time-consuming projects in the off-season – and often will do this at a better price than in the peak spring/summer season. Materials can often be cheaper at this time of year – again, it’s off-season. There very possibly will be some specials at the local building materials spots to help clear out old inventory before the spring – and new materials – start coming in. Your terrain will have time to recover to some degree over the next few months before it’s time to entertain outside again. When spring hits in earnest, any cleared out areas will fill in, grass will have time to recover, things will generally have time to get that finished look. Other great things that can be done in the colder off-season – tree removals and stump grinding. Again, a lot of this comes down to it being off-season. Your landscapers/tree people need to eat year round. While everyone will be mobbing and tying up their phone lines starting in late March and April with big ideas and big plans, right now is going to be a great time to get these things done at a great price. Get those trees taken down. You can also have limbs cleared out. Since the trees are dormant, you won’t see a massive “recovery” growth. Many times people will trim trees and shrubs in the spring. When they do that, it spurs the growth and actually can be rather counterproductive. It will encourage new growth where there might not have been growth before. But now there will be and it may grow larger than it was BEFORE the trimming. At an absolute minimum, what you can do is start working with your landscapers to come up with new plans for the spring. If you’re in a snow-bound area or just not quite ready to move yet, you can surely spend some quality time coming up with an awesome design and layout for your backyard. Some great off-season things that you may NOT have thought about? * As long as the temperature is above freezing – 40° F to be on the safe side, you should be absolutely fine in any brickwork. If you’re laying things like patios without concrete, it’s immaterial. Concrete though can have issues when it gets too cold. Speak to your professional and they will definitely be able to tell you when it’s appropriate to lay bricks/etc with concrete. There are truly so many things that you can do – even while it IS cold outside. Don’t waste your time because you’ll end up hating yourself later. Get thinking about the awesome lawn and landscape that is going to be YOURS in 2017!